A SQL product other than SQL Server 2014 CTP1 is detected. You cannot install this release until the existing instances of SQL products are uninstalled. SQL Server 2014 CTP 1 is prerelease software and should be installed only on a clean machine with no other SQL Server instance. Issue: The following sections define the limitations and restrictions that apply to SQL Server CTP 1. 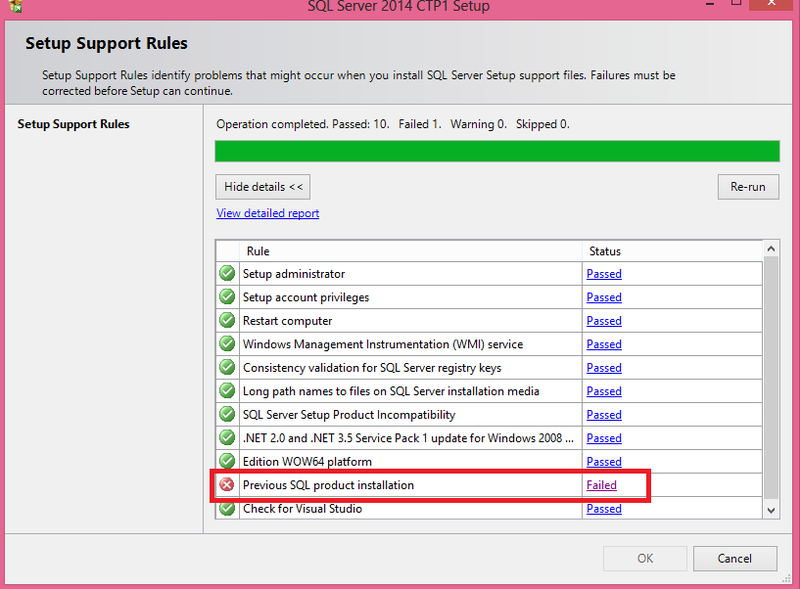 SQL Server 2014 CTP 1 is prerelease software and should be installed only on a clean machine. SQL Server 2014 CTP 1 is a NON-PRODUCTION release and should not be installed and used in production environments. SQL Server 2014 CTP 1 may contain branding from Microsoft SQL Server 2012 and is versioned as 11.0. SQL Server 2014 CTP 1 is only available in the English language. Microsoft SQL Server 2014 CTP 1 is not supported by Microsoft Customer Services and Support (CSS). 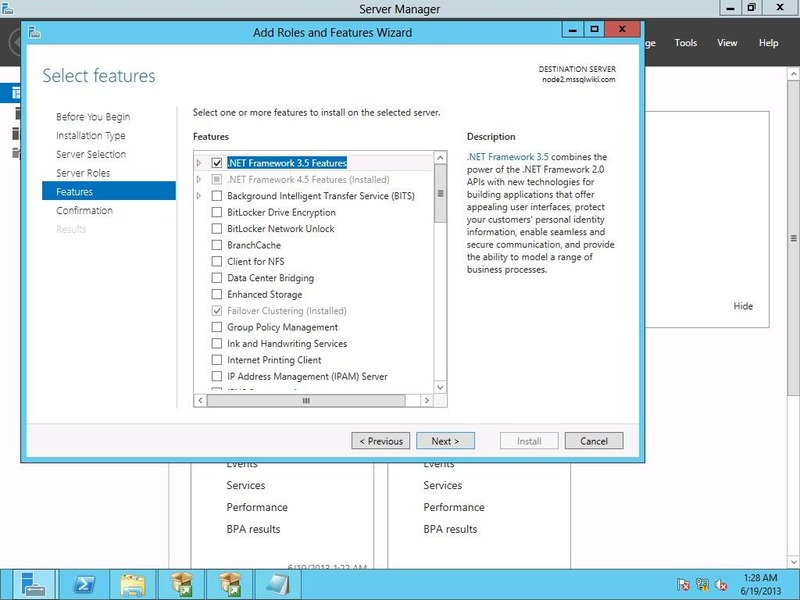 SQL Server 2012 setup might fails with below error when you do not have .Net frame work 3.5 features. To resolve the above error open server manager à Add roles and features wizard à select .Net frame work 3.5 feature and install as shown in below image. After some time you will notice “operation is taking longer time than expected” and eventually after the time out add node wizard will fail with error “Unable to successfully cleanup”. 1. To resolve the exclude UDP port 3343 from fire wall. 2. If the issue persists after opening the UDP port 3343. 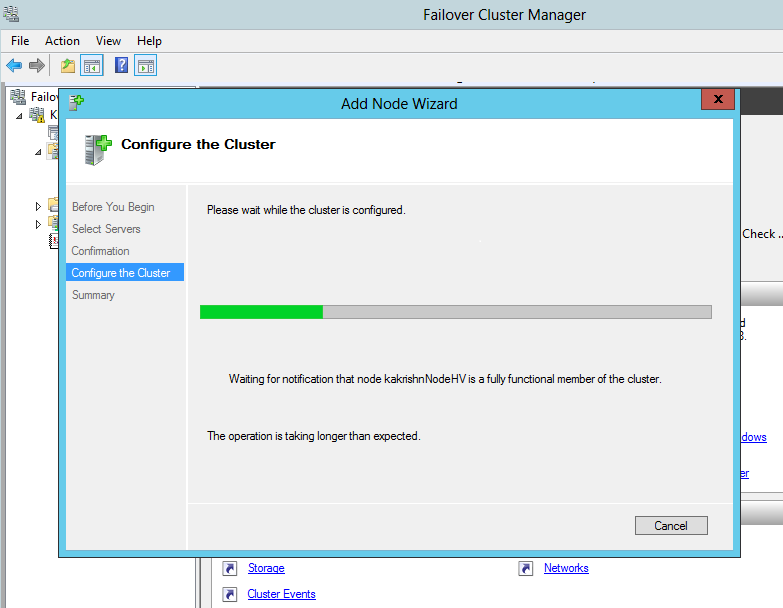 Check failover clustering diagnostic event for error “Failed to write SPNs to node’s computer object – status 5”. If you find above error make sure http://support.microsoft.com/kb/976424 is applied in Domain controller. 6. Make sure Symantec Endpoint Protection is uninstalled/disabled when you add the node. When you do bulk insert in SQL Server it may fail with below error because of double hop . Cannot bulk load because the file “\\path\” could not be opened. Operating system error code 5(failed to retrieve text for this error. Reason: 15105). 2. If the session is not using Kerberos authentication then fix the SPN issues (startup account of SQL Server should have read and write SPN permissions). Account which is running bulk inser should have read SPN permission. Setpn exe or adsiedit can be used to add or display all the SPN’s. If the SPn’s are registered properly and still connection fails to NTLM then get the output of SSPIClient.exe and verify why Kerberos authentication fails. 3. Make sure the account which is running bulk insert is trusted for delegation in Active Directory. 4. Account which is running bulk insert should have access to the shared directory in which BCP files are placed. If a SQL Server user is logged in using Windows Authentication, the user can read only the files accessible to the user account, independent of the security profile of the SQL Server process. When executing the BULK INSERT statement by using sqlcmd or osql, from one computer, inserting data into SQL Server on a second computer, and specifying a data_file on third computer by using a UNC path, you may receive a 4861 error. To resolve this error, use SQL Server Authentication and specify a SQL Server login that uses the security profile of the SQL Server process account, or configure Windows to enable security account delegation. For information about how to enable a user account to be trusted for delegation, see Windows Help. For more information about this and other security considerations for using BULK INSERT, see Import Bulk Data by Using BULK INSERT or OPENROWSET(BULK…) (SQL Server).